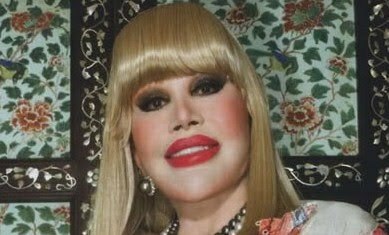 Her name is Khun Sumanee Guna-Kasem, and shes a well known thai socialite, who clearly has a troubling obsession with cosmetic surgery, to say the least! There is no clear evidence of her actual age, and at this point its almost impossible to make an educated guess, considering the complete Ronald McDonald transformation shes undergone. Judging from these photos, her list of plastic surgery procedures are presumed to include cheek implants, lip implants, facelift, nose job (rhinoplasty), eye lift (blepharoplasty), facial fillers and botox injections. Now I'm gonna go out on a limb and say, Khun Sumanee Guna-Kasem probably went a little overboard with this whole plastic surgery thing. But hey, i bet she has a heart of gold... or maybe porcelain at this point.